Since pressure is equal to the force per unit area, set A equal to 1. Then the formula pressure becomes P = h D Equation 2-5. It is essential that h and D be expressed in similar units. That is, if D is expressed in pounds per cubic foot, the value of h must be expressed in feet. If the desired pressure is to be expressed in pounds per square inch, the pressure formula, equation 2-5, becomes Equation 2-6. Pascal was also the first to prove by experiment that the shape and volume of a container in no way alters pressure. Thus in figure 2-8, if the pressure due to the weight of the liquid at a point on horizontal line H is 8 psi, the pressure is 8 psi everywhere at level H in the system. Equation 2-5 also shows that the pressure is independent of the shape and volume of a container. 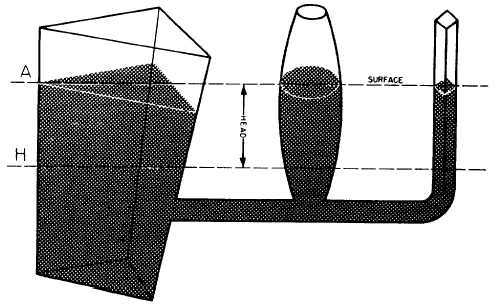 Pressure and Force in Fluid Power Systems Figure 2-9.Force transmitted through fluid. of the shape of the container. Consider the effect of this in the system shown in figure 2-9. If there is a resistance on the output piston and the input piston is pushed downward, a pressure is created through the fluid, which acts equally at right angles to surfaces in all parts of the container. 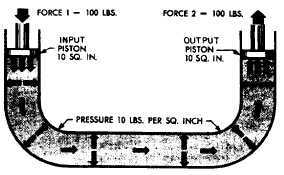 If force 1 is 100 pounds and the area of the input piston is 10 square inches, then the pressure in the fluid is 10 psi Recall that, according to Pascals law, any force applied to a confined fluid is transmitted in all directions throughout the fluid regardless NOTE: Fluid pressure cannot be created without resistance to flow. In this case, resistance Figure 2-8.Pressure relationship 2-6 with shape.